Preheat the oven to 230C, gas mark 8. Arrange the cake slices on a baking tray with plenty of space between them and sprinkle with the sherry. Spread the orange curd over each slice and top with a scoop of ice cream. Place in the freezer while you prepare the meringue. Whisk the egg whites until they form stiff peaks then add half the sugar. Continue whisking until stiff and glossy then fold in the remaining sugar. Spoon the meringue mixture over the ice cream and cake, covering completely. 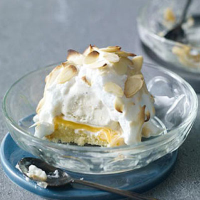 Sprinkle with a few flaked almonds and bake for 2–3 minutes until the meringue is just golden. Serve immediately. You could try this recipe using different flavoured sponge cakes – ginger would work well too. Baked Alaska has a delectable sweetness and needs a wine to match. Be clever with an Ice Wine, made with frozen grapes, from Waitrose Wine Direct (waitrose.com/wine) or try this Australian icon: De Bortoli Noble One Botrytis Semillon, New South Wales.